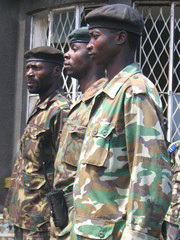 NAIROBI, 20 March 2007 (IRIN) - Soldiers of the Democratic Republic of Congo's national army and the police have been involved in human rights violations in the eastern Ituri region, and are allegedly responsible for growing insecurity in North Kivu, according to a United Nations report. The February human rights assessment report by the UN Mission in DRC (MONUC) said operations by the Forces armées de la république démocratique du Congo (FARDC), the national army, against militias had led to increasing allegations of human rights violations against civilians. In December, 67 villagers were arrested in Waledu Pitsi, Djugu territory in Orientale province. Of these, 50 suffered torture, cruel, inhuman and degrading treatment, including 30 women who were allegedly raped by policemen. The report, which lists various violations, said preliminary investigations in Karawa, 75km northwest of Gemena, showed that the policemen came from several places as reinforcements after the destruction of a police station by 250 villagers on 27 December. "No legal or disciplinary action has yet been taken against the commander of the police officers who were implicated in the incidents," it noted, adding that the police had been implicated in "a steadily increasing number of human rights violations during the month of February". In Ituri, army operations against the Front des nationalistes et intégrationnistes (FNI) militias had resulted in troops going on the rampage, looting and harassing people in local villages in February. After 12 villages were reportedly burnt, most inhabitants fled into the forest. The militias were reportedly responsible for the vast majority of sexual violence cases in Fataki, committed during fighting with the army. "A local hospital registered 16 cases in December, 17 cases in January and seven cases for the first week of February," it noted. The FNI, whose leader, Peter Karim, was made a colonel in the national army in October 2006, started handing in their arms in a village near Lake Albert on the DRC's border with Uganda at the end of February. The report said army troops burnt down the localities of Sanduku, Riza and Kpakala on 7 February. "The population from these villages was allegedly massively displaced toward Libi, where Peter Karim was reportedly operating," the report said. Several other incidents of looting, killing and harassment of civilians are cited. "FARDC soldiers were responsible for many human rights violations, particularly the right to life, physical integrity and the right to liberty and security of person throughout the DRC," the report stated. The report also noted attacks against or ill-treatment of former army military personnel who had opted for demobilisation in North Kivu, especially in Rutshuru, and the arrests of civilians by the national intelligence agency. The FARDC is an integrated national army, comprised of former rebel fighters, militia and soldiers from the former national army.